Have your cake and eat it too? Absolutely! 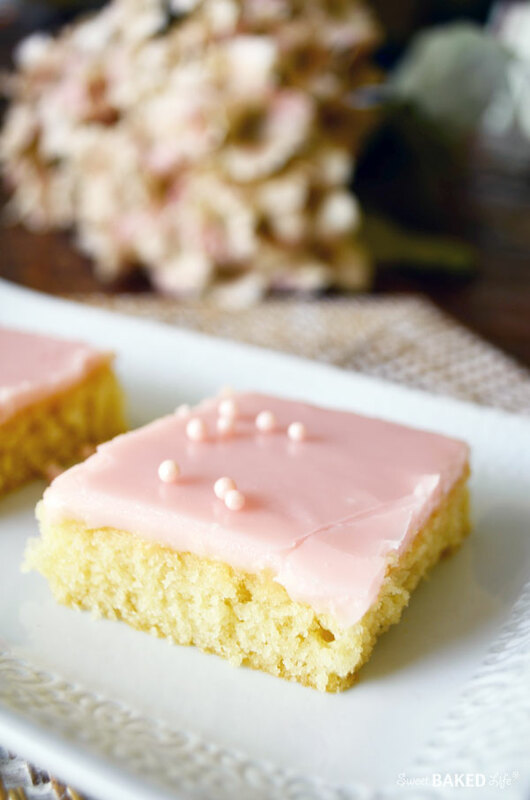 So get ready to celebrate the summer with mouth-watering Pink Lemonade Sheet Cake! And believe me it looks as good as it tastes and is easy to make too! Now let’s get on to all this pretty in pink deliciousness! You see, it was my birthday on Tuesday and my mom decided to come for a visit last weekend to celebrate with me and my family (since she could not be here on the actual day). She told me in advance not to bake anything! What?!! Ok, I had to agree. We had a lovely time, even though it was over 100 degrees!!! She spoiled me with gifts and love and surprised us with a tangy lemon layered cake from a wonderful bakery in Marin. It was quite tasty. Thanks mom for always making me feel so special. And for knowing that I love lemon!!! However, since we did have an early party with my mom, I still wanted to bake something for my actual birthday to celebrate with my family and to share with my co-wokers (oh how they love it when I bring my treats into the office!). I knew I wanted to make something that was light (I do not mean in calories! ), refreshing and of course, pink! 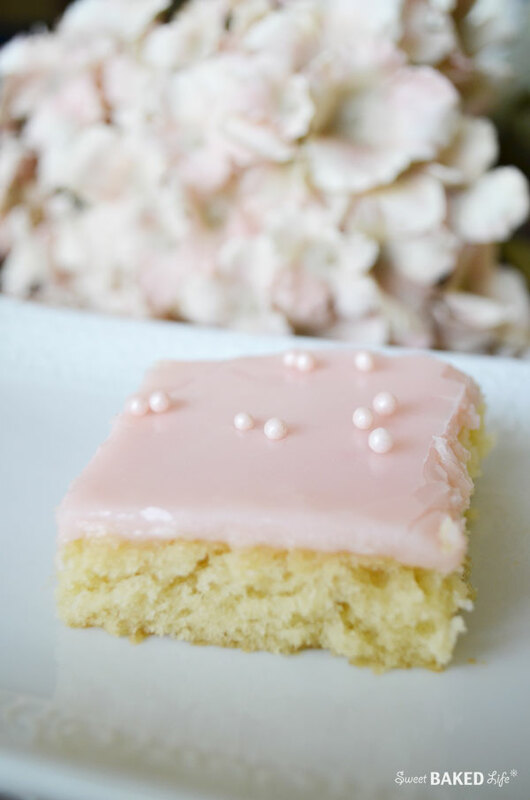 As I thought about this special dessert I finally decided on a white cake with pink frosting (of course!). As I kept thinking about how I wanted this to look and taste, then pink lemonade popped into my head. And well, the rest is history! This fluffy white cake topped with sweet yet tart pink lemonade frosting is truly heavenly! Heat your oven to 350 degrees. Spray an 18×13-inch sheet pan (or jelly roll pan) with non-stick cooking spray and set aside. In a large bowl, combine the flour, sugar, baking soda and salt. Stir to combine. In a small bowl add the eggs, sour cream and vanilla extract and beat with a whisk until combined. Then in a medium saucepan bring the water and butter to a boil. Slowly pour butter mixture into the flour mixture and stir until combined. Then add the egg mixture and stir until fully combined and smooth. Pour into the prepared pan and bake for 20-22 minutes, or until a toothpick comes out clean. Let cool for about 10 minutes on a wire rack. While the cake is cooling make the frosting. Add the butter to a medium saucepan and heat until melted. Remove from heat and whisk in the confectioners sugar and the thawed pink lemonade concentrate (a little at a time, and continue adding until you have the lemony taste you desire). If you wish to have a darker pink color, add a few drops of red food coloring. Pour over cake and spread evenly with an offset knife or spatula. 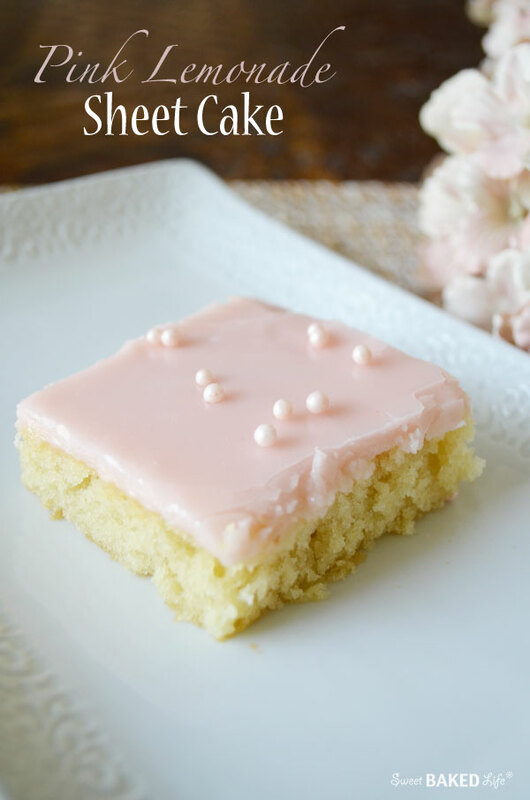 Sprinkle with pink pearls, cut into pieces and serve room temperature. 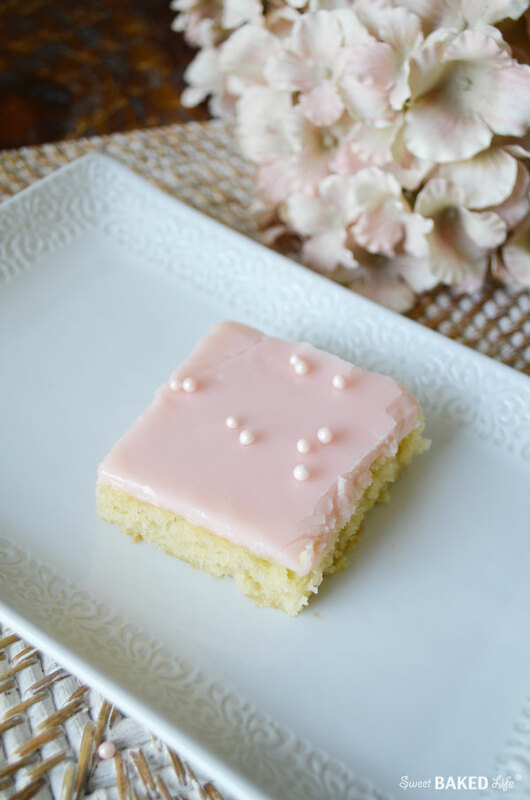 This pretty Pink Lemonade Sheet Cake was perfect. And it’s sure to be a hit at any summer celebration, especially a birthday party or bridal shower! Now here’s to the rest of my birth-month and to the wonderful days of summer!!! Sheila brought some of this in for us workerbees …. was really wonderful! The cake looks so pretty with the pearly sprinkles! Thanks Nancy, it’s definitely pretty in pink! Sounds fabulous! I will certainly make this soon! Thanks Kellie! I’m sure you will love it! This looks fabulous! I wish I could get lemonade concentrate in the UK! Oh, I wish you could too, or I wish I could send you some!!!! This is SO pretty. And I love the lemonade flavor! This cake looks so moist and pretty…what a great idea! Thanks for sharing! Thanks for your kind comment Jodee! Have a great weekend! Stopping by from the Saturday Night Fever link up. My mother-in-law loves to make pink lemonade-flavored deserts. I’ll have to pass this along to her. Thanks for sharing! Thanks and I hope your mother-in-law loves this! We eat eggless, can you suggest some egg replacement? Thank you! And even though I have not baked a recipe substituting eggs, I have read that you can use the following: 1 egg = either 1/3 cup applesauce, 1/4 cup yogurt, 1/4 cup vegetable oil. So for this recipe, which calls for 2 eggs, you would have to double the ingredient; example 2 eggs = 1/2 cup yogurt. This cake looks delicious! I want to jump right through my screen and take a bite! I love everything about this cake!! 🙂 Pink lemonade sheet cake just screams summertime! This looked so pretty I just had to bake it. I didn’t have any lemonade concentrate, but added a little sparkling lemonade instead and it was still fabulous! And, it freezes really well. It tastes even better than it looks, if that is possible! Thanks Patty! Glad you enjoyed it and were able to improvise. Don’t you just love the texture of this cake? I made this yesterday for a church luncheon. It was a big hit. It makes at least 24 or more squares. The cake is rich and moist and the pink lemonade frosting is appealing in a soft pink and lemon flavored. I cut back slightly on the confectioners sugar as it doesn’t need a full pound and worked out fine. Next time I will use a more buttery frosting or I will use chocolate. Could you substitute buttermilk for the water called for in the cake recipe? Hello Becky, I have not tried buttermilk in place for the water in this recipe — however, the boiling water gives the cake the soft texture! My largest cake pan is 11×15. Any idea on what to adjust the baking time to? Robyn, I have made this recipe in a smaller baking pan — I would first check at 20 mins, and see how it looks, I would estimate it may need about another 10 minutes.